The author taking an elephant riding lesson. Photo by Kate Donnelly. The elephants of the Golden Triangle are well beloved by any traveler who has met them. Fathom contributor Kate Donnelly checks into the Four Seasons Tented Camp in Thailand and discovers firsthand their cute and charming appeal. Have you ever taken a trip so spectacular, so otherworldly, it's hard to put it into words? A trip where, if you close your eyes, it feels like a dream? A few days where, in the retelling, you sound boastful? 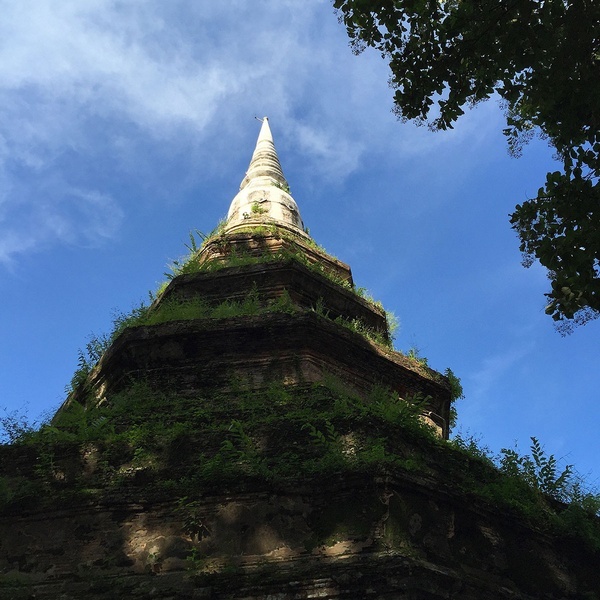 Such were my feelings after my trip to Four Seasons Tented Camp in The Golden Triangle, where the borders of Thailand, Burma, and Laos dovetail in an exotic bamboo jungle of expansive hills and grasslands. The Camp is one of those remote, path-less-chosen destinations shrouded in mysticism — fifteen lofty and luxury tents flawlessly spaced along a winding brick path with a thick bamboo forest and views of sultry lowlands and lush greenery. 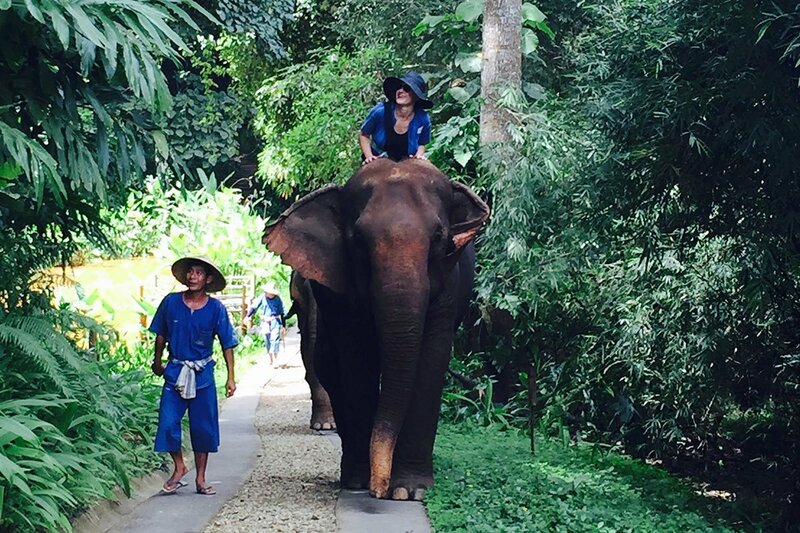 If any animal was ever revered, it's the elephant in Thailand. 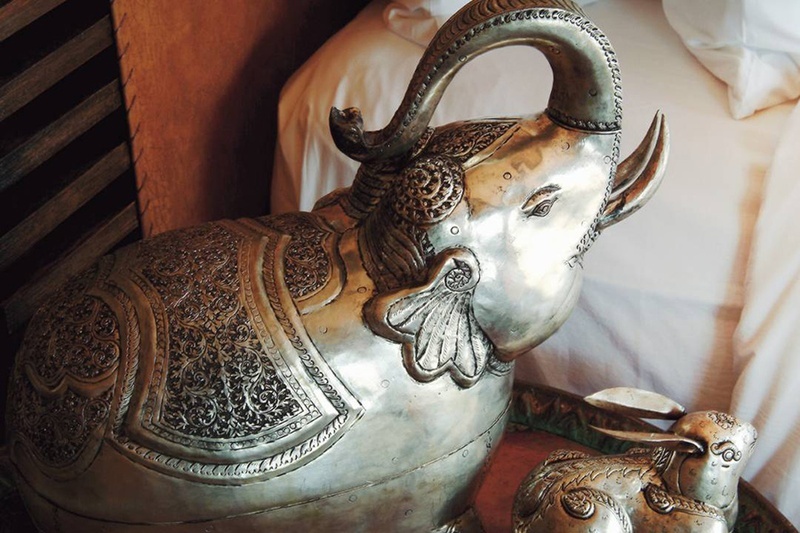 A cultural icon since the ancient days, the elephant is a symbol of royalty and fortune. Recently, the strong, calm, gentle giants have been used for such non-royal tasks as transporting timber in teak forests and walking the mean streets of Bangkok. Abused elephants have been rescued with help from the Golden Triangle Asian Elephant Foundation and placed in safe sanctuaries like Tented Camp, where guests can learn to command, ride, and feed them. Luxury tents in the jungle. Hotel photos courtesy of Four Seasons Tented Camp Golden Triangle. Burma Bar. 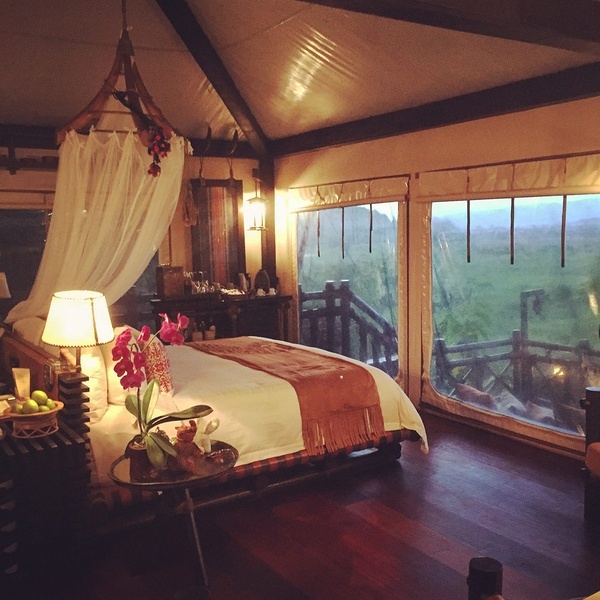 Photo courtesy of Four Seasons Tented Camp. Down a winding path is a thatched spa, essentially a hut, deep in the forest. The Ruak Ritual treatment, which uses local herbs and natural bamboo sticks, combined with the natural sounds of wind and birds, put me at ease before a quick dip in the small pool. The Trading Post (aka Jungle Gift Shop) stocks great Golden Triangle crafts; Doi Tung Royal Project products; silk scarves made by the wives of the elephant handlers, who are called mahouts; and elephant motif glassware, which you will undoubtedly be drinking and eating from throughout the trip. A small collection of classic Land Rovers all woo anyone (like me) who loves a splendid collection of outback, safari vehicles. Over breakfast at open-air restaurant Nong Yao, I waited for a pair of elephants to stop by for a snack. 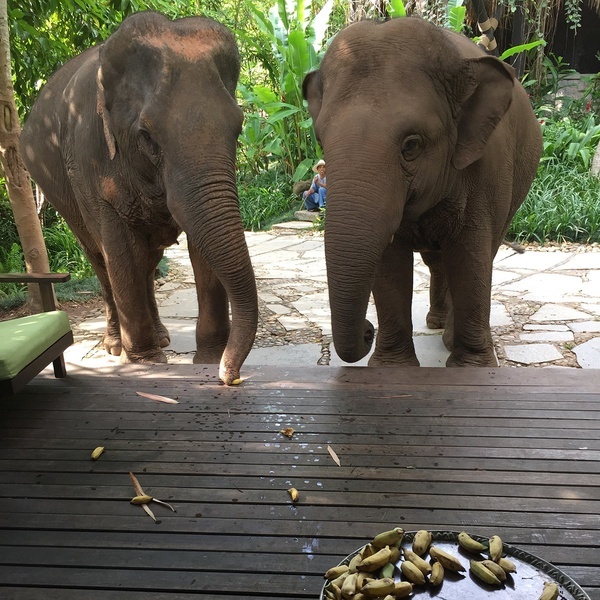 The sweet elephants gently took bananas from my hand with their trunks and shuffled them in their mouths. Elephants seem to love nothing more than bananas. The restaurant serves Thai, Laotian, Burmese, and Western dishes. At lunch, I liked khoa soi, a northern dish reminiscent of a Massaman curry, a bit sweet with chicken and crunchy noodles on top — a comfort dish you'll dream about. At dinner, the traditional Northern-style meat and tart dis kanom jeen narm ngeiw was perfect with a glass of crisp white wine. This one merits its own mention. The chic, low-lit Burma Bar is where you congregate before sunset to meet fellow campers and sip something from the hip bartender, Ted. Now for that sunset — a cast of hues in light blues, oranges, and golden yellows on the Ruak River. It's as memorable as the bar's camp décor: leather sofas with bright textiled pillows, wooden elephants draped in turquoise beads, and a double-sided fireplace. Tents are named after local hill tribes, flora, and fauna. I stayed in The Hilltribe Tent (no. 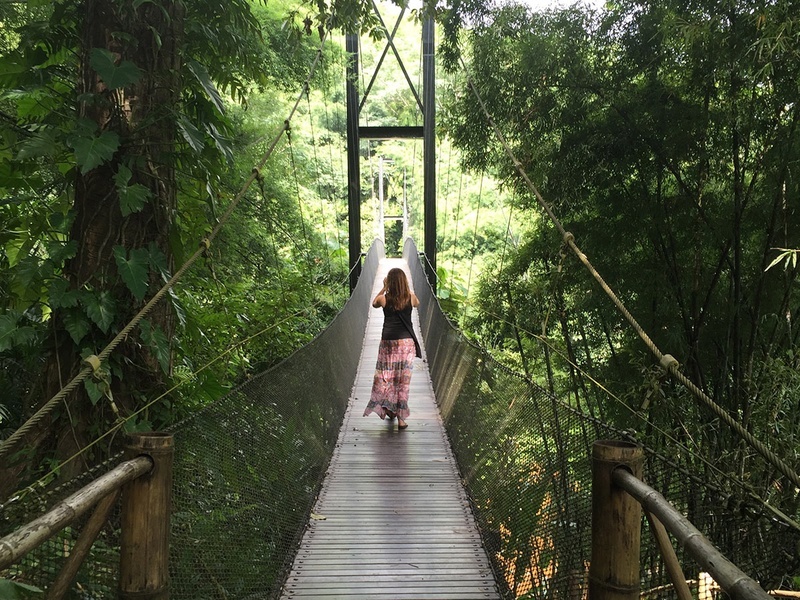 12), a heart-spiking walk from the main area, across a highly Instagram-able suspension bridge. 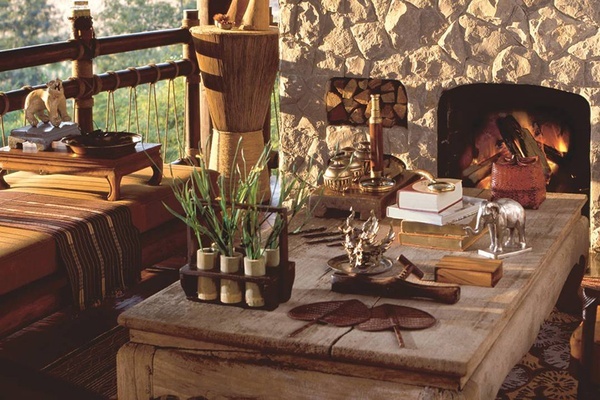 Taking a queue from rustic, luxe African safari tents, designer Bill Bensley added northern Thai village flourishes and wood and leather pieces, channeling a 19th-century colonial explorer's dwelling (think part Peter Beard, part Indiana Jones, part Karen Blixen). All tents have a slightly different color palate and decor. Inside, it's all about the details. A warm yellow hue melds with natural wood; elephant motifs abound, in the bath faucet shaped line an elephant head and sink levers in the form of tusks. The beds, the legendary custom Four Seasons mattresses, have white linens, a sheer canopy halo, and a savvy pop from pink throw pillows. I spent early afternoons on my terrace with a cold bottle of Singha beer and a bowl of traditional puffed, salty Thai pork scratchings. At the end of the day, I fell asleep to sounds of crickets drowned out by an oscillating fan with an elephant medallion. In the morning, I was awakened by birds and revived in an outdoor rain shower with a view of the lush greenery of Laos and Burma. The tent interior. Photos by Kate Donnelly. Truly, the magic of this place is the unfiltered, unforgettable access to these glorious beasts. 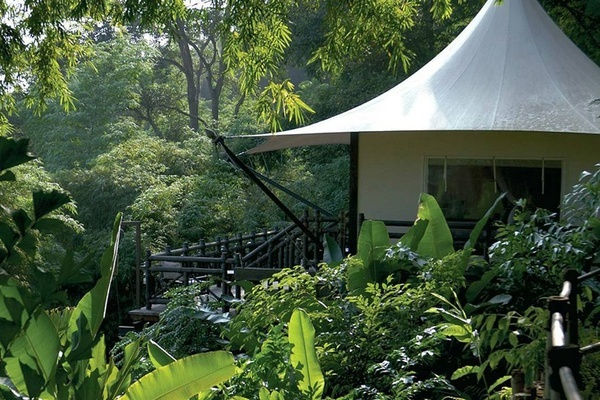 Tented Camp Golden Triangle is the Jurassic Park of majestic elephants. A highlight (not of my trip but maybe of my life) was the half-day mahout training. I learned how to mount an elephant (there are three ways), how to keep my feet tucked behind those floppy ears. I leaned basic commands: Move forward (pai), turn (baen), stop (how), go backwards (soak). Speaking of soaking, if you happen to be on 59-year-old Thong Kam, like me, you will take great joy in hosing down the elephants from the heat, letting them drink from the nozzle. They will show their gratitude by raising their trunks and spraying you. Anyone who loves animals. Anyone who appreciates drawing a bath in a hand-hammered copper tub. Anyone who loves waking up early to watch a warm sunrise sneak over three countries. Anyone who appreciates genuinely kind service. Anyone who wants a once-in-a-lifetime soujourn. And anyone who needs inspiration for the first chapter of their adventure novel. People who want to plug in. And anyone who can’t appreciate golden sunsets. Expect to stay two, three or four nights, with rates from $2,100 USD per tent per night. The hotel is all-inclusive and, yes, pricey, but it’s an unbelievable, once-in-a-lifetime experience. The author in the hotel Land Rover. Photo by Kate Donnelly. The author walking the suspension bridge. Photo by Kate Donnelly. The temple in Mae Sai. Photo by Kate Donnelly. Do you have to leave the glory of the elephants? If you do, a short boat ride from camp down Ruak River will lead to the Mekong River, where you can turn off the engine and float in the middle of three countries. 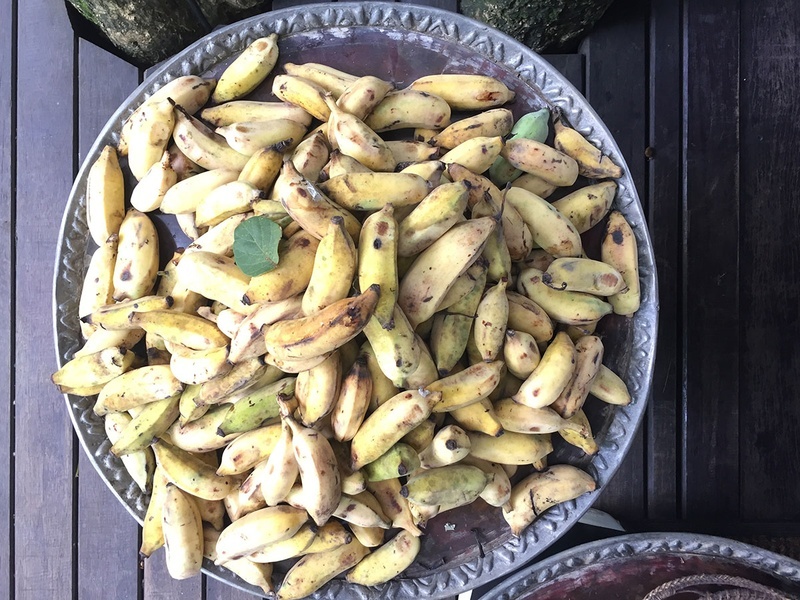 Eventually, you'll get to tiny Mae Sai village, where you can visit Thai food markets filled with fresh produce, meats, and vendors watching Muay Thai kickboxing. Just down the street is a temple and local vendors selling patterned wares. The nearby Hall of Opium illustrates the history and impact of this devastating narcotic. However, if you don't have to to go anywhere, just stay on the premises. I flew Cathay Pacific Airways, which offers daily non-stop service to Hong Kong from eight North American gateways: Boston, Chicago, Los Angeles, Newark, New York JFK, San Francisco, Toronto, and Vancouver. From Hong Kong, I took Cathay's sister airline Dragonair to Chiang Mai International airport (CNX), Thailand's main international hub. A regional flight to Chang Rai International aiport (CEI) is much closer to the hotel and is a great choice if you’re already in Thailand, as it is only available to international travelers via Bangkok. Tented Camp arranges pickup from both airports. My drive from Chiang Mai was just over three hours through stunning mountainous countryside. I highly recommend breaking up the drive with American-style pies and robust northern Thai coffee from open-air Charin Gardin restaurant. 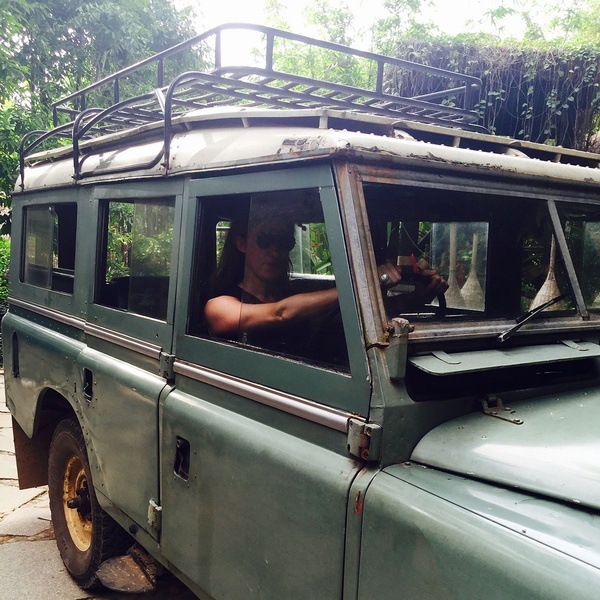 Getting around the property includes walking or getting a lift from one of the camp's old-style Land Rovers.